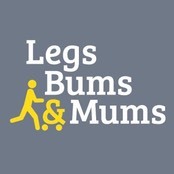 “I recommend Maria Holley's Legs, Bums and Mums classes to all Local Mums, her�classes are brilliant. I always leave feeling so positive and energised! Regardless of how many participants are there, it feels like it's almost a one-to-one class as Maria is so attentive, making sure your technique is right and making sure you get the best work out for you. She's great with the babies when they start getting grouchy too, so that you can concentrate on exercising. One of the best things I've done during maternity leave, I would highly recommend them and such a reasonable price too." These classes are designed for pre and post natal women, from six weeks onwards (10 weeks if you have had a caesarean) and are a total body workout. They are a great way to meet local mums and give you and your baby some fresh air, whilst getting back in shape at the same time. The only equipment we use is the environment around us and some resistance bands, which is a more suitable approach after giving birth than heavy weights. At the end of your first session, your instructor can check your stomach to see if your abdominal muscles have come back together. If you have a separation, you will be advised which abdominal exercises are best for you. (classes commence from 19th September). This will be slightly different from my other buggy classes as it will have a HIIT element to it (High Intensity Interval Training) and because of this will only last 45mins long. It will still have low impact options for those people who have just had a baby. I am also launching a new service – small group training on a Friday morning for a�maximum of four people with or without children. �You can book in blocks�of four weeks either as a group of friends or as an individual. The smaller�classes enable a more bespoke approach to training. For those that are looking for a totally bespoke approach I offers�personal training through�Maria Holley Fitness. I will design a plan�based on your individual needs and circumstances to help you achieve your�goals. �I have worked with individuals trying to improve their sporting�performance, professional dancers and people just looking to get back into�shape. �Whatever your goal, there is a plan that can help you. I have recently launched a�women-only (not just post-natal) class on Fridays in Banstead and�I also run classes in Carshalton,�Wallington, Redhill and Caterham. If you have any questions regarding my classes just give me a call! 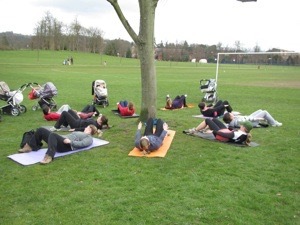 Maria also runs�Legs, Bums and Mums�post-natal classes for mums to excercise with their babies in local parks. So if you fancy some of Maria’s star treatment, give her a call to find out about her popular clases or just turn up and join in!